1. No fingerprints were removed from the car that Adam Lanza, the purported shooter, was allegedly driving. Yet, he was not wearing gloves. 2. Two AAA Cards were located in the Lanza home. A call to AAA tells us that BOTH of those cards were in the name “Ryan Lanza”- even the one that SAYS Adam Lanza. Each card had a different member ID ***-*****-***-8 and ***-*****-***-9. 3. When asked by press, the CME (chief medical examiner) H. Wayne Carver, M.D. stated that “Yes, the long gun was used,” referring to the fact that the AR-15 was the murder weapon of the victims in the school. However, NO rifle was found in the school, but four handguns were. The rifle was in the trunk of the vehicle parked in front of the school. 6. The black Honda Civic we were first told was registered to a Chris Rodia (petty larcenist offender who also had a string of drug charges); but then it was reported that was an error and a miscommunication in officer radio transmission. (Rodia was actually pulled over in a town 30 mins away, Greenwich CT, that morning, and officers said the radio somehow ‘picked up’ that transmission when the ‘wires got crossed’. We were then told the car was registered to Nancy Lanza, Adam’s mother. 7. The car’s four doors were all open in front of the school and black sweatshirts were strewn on the ground around the car. How does this match with the lone gunman scenario? 8. We were told that the school principal installed new security systems in the school that year (2012). FOIA requests have returned since then and have determined that the security system was installed in 2006 and there have been no requests for service, or upgrades, since that year. 9. Sally Cox, school nurse for 15 years, said that Nancy Lanza was a kindergarten teacher at the school for 15 years. A quote from her as reported by the MSM is as follows: “She was a loving, caring, and absolutely wonderful kindergarten teacher. The type of teacher you would want working with your 5 year old children.” We were then told by the Mainstream Media (“MSM”) that officials stated that Cox’s statement was not accurate and she made a mistake. That Nancy Lanza never worked or volunteered in the school, and that she was in fact, never a teacher there, or anywhere else. 10. DNA in Lanza home on a) Christmas card addressed to Sandy Hook elementary school students and b) on .22 caliber cartridges returned a hit for a New York Offender in the National DNA database of offenders. WHOSE DNA IS THAT? Why is this investigation closed if this DNA exists? Why did no one report on this relatively huge piece of evidence? 12. The police report states that Lanza’s hands were handcuffed behind his back, but that he died of a self-inflicted gunshot wound. Wait……….. what? 13. Mary Sherlach, school psychologist, was a victim of Sandy Hook, was murdered on December 14, 2012. However, miraculously, in January 2013 she renewed her certification for 5 years. 14. Not one photograph of a dead body, or injured person, has been provided from this event. 15. We have not seen ONE photo of Adam Lanza, at the scene, or deceased. 16. NO CCTV video footage has been released. 17. Four teachers were in a classroom, according to police report, attending a meeting. No kids were in the classroom. The report says they broke a window, and three climbed out. The fourth couldn’t fit through, so they left her behind. The three who climbed out of the window they broke fled .9 mile away to the Subway sandwich shop. Running right past the firehouse where the ambulances, police, and others were. The police report says the Subway restaurant is across the street from the school. It is not. It is just shy of a mile away, and in between the school and Subway there are a dozen other businesses and, as stated, the Sandy Hook Fire Dept. Wait…….. what? 18. On 12/15/12, the day after the shooting, a moving company was in the school removing furniture and supplies out of the school to the Chalk Hill Monroe, CT location. One day after. 19. The school has since been demolished and those who entered the school entered into a secret arrangement with the Attorney General’s office and the town clerk all signed lifetime gag orders. I do not purport to know why, but I do know it does not help eliminate the suggestion that there is something to hide here. 20. Adam Lanza, according to the MSM, did not speak to anyone in the last few months of his life, but rather, communicated only via email. However, none of those communications have been provided to the Sandy Hook Advisory Commission, and there have been no answers as to why it is taking so long for them to be made available. 21. The Hartford Courant described the investigation as “Secrecy, Funding Hobble Sandy Hook Commission”- referring to the 12 panel team commissioned with the job of finding some more answers to what happened, and who Adam Lanza was, and the fact that the Attorney Stephen Sedensky’s “veil of secrecy” about this is blocking access to the truth. And…funding? There have been millions of dollars funneled into different political channels in response to this. There should be plenty of money for things like legal fees and subpoenas. 22. There were, allegedly, 626 students in Sandy Hook the day of the shooting. So, subtract 20 for the allegedly murdered children, and you’re left with 606 kids. Where were they? No buses took kids away, all we have is 1 picture of about 6-8 kids being led through a parking lot in a line. 606 students would be a dozen buses FULL of kids, however, we don’t see ANYONE leaving the school. 23. The number of individuals who question what happened at Sandy Hook is growing, but as fast as it grows is as quickly as efforts are made to silence it. One of the people speaking out is Federal School Safety consultant Wolfgang Halbig. A former FL state trooper, and a trainer in incident command, mass casualty incidents, and a federal school safety consultant hired to consult after Columbine, Halbig has started “Sandy Hook Justice”- which is growing from a handful of critical thinkers, to a grassroots movement for truth. He is not alone, by any means, nor is he the most prestigious/well-known individual to question the story, but his efforts to hire lawyers, and travel to Newtown from his comfortable, quiet life of retirement as a grandfather living with his wife in Florida, has drawn national attention- the meeting at the Newtown Board of Education can be viewed online on Newtown.gov or YouTube. Dozens traveled to Newtown in pursuit of truth. No answers have been provided. FOIA requests, which are legally mandated to be responded to in 4 business days, have gone unheeded for 11 months now. 24. H. Wayne Carver, medical examiner, was described by Piers Morgan as being “grossly unprofessional” as he laughed- chuckled even- during his press conference. His infamous comment “I hope this doesn’t come crashing down on their [people of Newtown] heads later” was eerie and ominous, if not outright confusing. What did he mean? Remember, this is the same Med Examiner who put in his resignation earlier in 2012, and only when the govt came to him and asked that he stay, which he said he would ONLY do if they created a CT State Statute mandating that PEDIATRIC HOMICIDE AUTOPSIES REMAINED SEALED did Carver agree to maintain his role as Chief Medical Examiner. 25. Gene Rosen, a man who lives adjacent to the school, reported to the MSM that 6 children were on his lawn that morning “sitting in a circle, like a little reading group. At first I thought they were boy scouts.” He states that he did not call 9-1-1. He states that he took the children up his long hill of a driveway, and into his home, where he gave them stuffed animals, and juice. The bus driver, a woman who he says was standing with the children, did not call 9-1-1 either. In another interview with the MSM, Gene refers to the adult with the children as a male, stating, “He was yelling at them, harshly, ‘It’s going to be okay! Everything will be okay!’, and then left. I don’t know where he went.” Gene reported to the MSM that parents were coming to his front door looking for their children that day. 26. Anderson Cooper, a former CIA intern, interviewed parents in front of what is, very, very obviously, a green screen, meaning he was not on site, but rather was at a studio or production area purporting to be ‘on scene’. This in and of itself is not concerning too deeply- dishonest, yes- but something that other media personnel mislead the public with all the time. However, taking into account the totality of the circumstances, secrecy and lies, it is another troubling fact….especially since when accusations were brought that he did so, he adamantly denied them. Adam Lanza, CONTRARY TO MSM AND “Official reports” was NEVER enrolled in classes at Western (WCSU). The FBI’s report on Sandy Hook was heavily redacted. They are in a position to know that nobody was killed on 12/14/12. In this context, you might study the history of the Piltdown Man. Scientists who expressed skepticism about it from the start were ignored, but proven right in the end. Piltdown Man was the greatest scandal to rock science in history to date. A hoax whose perpetrator is still unknown for sure, Piltdown revealed the science’s soft spot: preconceived notions, bias, and consensus of the scientific community willing to perpetuate a particular scientific paradigm. The State’s Attorney’s report on the alleged shooting at Sandy Hook had no forensic evidence to tie the alleged shooter’s weapon to any of the alleged victims. The State of Connecticut has produced no visual evidence that anybody was killed, no visual evidence that more than 400 people were evacuated from the school; no maintenance records, kitchen records, and other records to prove that the school was an active one as of the date of the alleged shooting; no evidence that law enforcement called for medical helicopters to come to the scene to aid 26 people who had allegedly been shot; no name released of the man who ran into the woods chased by officers; and no records of a hazardous material clean up of blood and bodily fluids. Governor Malloy said at a press conferences on 12/14/12, “The Lieutenant Governor and I have spoken to in an attempt that we might be prepared for something like this playing itself out in our state.” Who spoke to him? When? If he was spoken to beforehand, why did he not take steps to prevent it, if it was indeed a real shooting? You are well-educated people. You would not have been appointed to the Commission had it not been for your trained critically-thinking minds. You are people with academic integrity. I know that you do not take anything at face value, and that you must scrutinize the facts before you come to a conclusion. It appears to me that your Commission has concluded that the official story is true, and that you have done nothing to critique the official story. Yet, as you probably know, the State’s Attorney report had no forensic evidence to tie the alleged shooter’s weapon to any of the alleged victims. Please provide me your visual evidence that anybody was killed. Please provide me your visual evidence that more than 400 people were evacuated from the school. Please provide me with maintenance notes, kitchen records, and other records to prove that the school was an active one as of the date of the alleged shooting. Please provide me with evidence that law enforcement called for medical helicopters to come to the scene to aid 26 people who had allegedly been shot. Please provide me the name of the person dressed in camouflage whom officers chased into the woods by the school. Please provide me with the records of the hazardous material clean up of blood and bodily fluids. Explain what Governor Malloy meant when he said at a press conferences that day, “The Lieutenant Governor and I have spoken to in an attempt that we might be prepared for something like this playing itself out in our state.” Who spoke to him? When? If he was spoken to beforehand, why did he not take steps to prevent it? I’m sure that, since as professionals you have already done your basic research on this matter, you can quickly put these documents on a disc and send me the disc. As I’m sure you are people of integrity, I do expect a full and complete response. I will pay reasonable costs. 2. Why and for what reason would the FBI classify the Sandy Hook Elementary School Shooting when they did not classify the Columbine shooting, which also was a mass casualty shooting incident? • Who on Dec 14, 2012 at the Incident Command Center made the ordering of Porta Potties a high priority since they were delivered within 3 hours of the school shooting? Never ever heard of. • Who ordered those Porta Potties from Southbury, Ct? • When I called the Porta Pottie Company after searching for over a week as to who and when they were ordered, I was told that it is classified and they are not allowed to share that information with me. • The next morning I received a phone call from the Southbury Police Department at my home telling me not to call that company again, since I was harassing them. • High priority for toilets but not for Life Star Trauma helicopters or paramedics. 7. Who was the Certified Environmental Bio-Hazard Decontamination company contracted by the Newtown Public Schools to remove 45-65 gallons of blood, skull fragments, brain tissues, bodily fluids, blood soaked carpets and any other contaminated are a inside the Sandy Hook School? 8. Why does an off-duty Lt. from the Newtown Police Department refuse to leave his off-duty work assignment at a construction site on Dec 14, 2012 when hearing that shots have been fired at the Sandy Hook Elementary School? 9. Who at the Newtown Public Schools notified all of the parents in writing as required by CT law that had children attending the Sandy Hook Elementary School as well as every school staff member every school year of all the potential life-threatening chemical hazards. The school had high levels of lead paint throughout the entire school, asbestos in the ceiling time and floor tile, asbestos in the insulation and most of all the school had very high levels of PCB. 11. Who treated those two children who had been shot multiple times, like three to 11 times, since they did not allow the paramedics and EMT’S inside the Sandy Hook Elementary School? 15. Why would a police officer by the name of Lt Vangehle at 9:45:21 a.m. on Dec 14, 2012 from the Newtown Police Department after finding a kindergarten female child in the hallway, make her go into room eight (8) and leave her? Room eight is a gruesome crime scene with dead children and school staff. Why? 16. Why would two CT State Troopers enter room ten (10) at 9:55:31 am on Dec 14, 2012–which is a gruesome crime scene with dead bodies of children and school staff–and tell a kindergarten boy who they find in the bathroom whose name is redacted and tell them so it must be more than one, to stay and they will be both back when it is safe? Under the official story, a skinny, untrained kid in full riot gear evaded a state-of-the-art security system and had a 100% kill rate in a span of a few minutes with an assault rifle (which was in his trunk). The police parked a quarter of a mile away from the school, and then walked to the school–hardly normal procedure. The only footage of cops responding with any sense of urgency showed cops at another school, St. Rose of Lima. Porto Potties were delivered on site. Police denied paramedics access to the school. The parents of the “dead children” were laughing. “Missing” (destroyed) security camera footage from the school, which had a state-of-the-art security system. Medical Examiner gives vague, evasive answers to questions. The “bodies” were removed from the school under cover of darkness. The “grieving parents” were not allowed to see their children’s bodies. People are pronounced “dead” (by whom?) within 11 minutes without transport to a hospital, when only an M.D. can legally pronounce a person dead, and it is done at a hospital. Witness saw 7 or 8 police cars go by before she heard shooting. Destruction of alleged crime scene (razing of school by workers who had to sign confidentiality agreements), so that workers cannot speak publicly about the absence of bullet marks on the walls or blood on the floor of the classrooms. Stephen Barton (family home 5 miles from Newtown) “shot” at Aurora theater after he “just happened” to photograph his Dark Knight Rises movie ticket, and hired by Mayor Bloomberg to advocate gun control. “The Dark Knight Rises,” Batman movie, refers to Sandy Hook. Former private bus driver replaced before the “shootings” had complained about a high-level conspiracy. False flag attacks often are orchestrated under cover of drills so that the perpetrators of the hoax have their operatives in place. For example, FEMA arrived in NYC on the evening September 10th, 2001 to conduct drills. This is a well-produced documentary that details many of the inconsistencies of the Sandy Hook school event that took place in December 2012. The event that happened was in fact a HOAX. 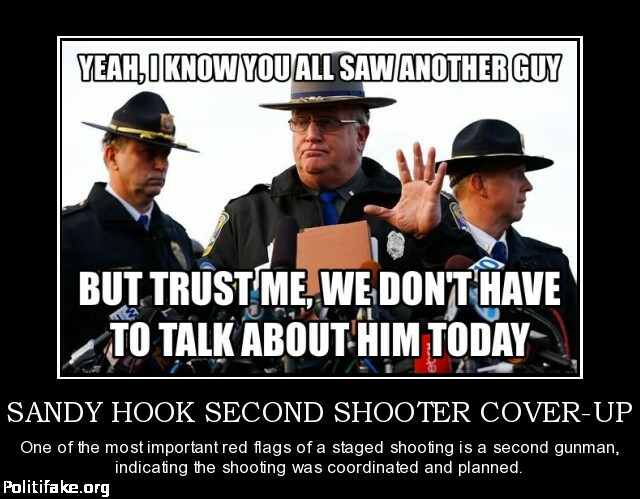 The string of hoaxes and/or false flags (all that have gained prominent attention in the news), all seem to be connected and/or overseen at the federal level. Tucson 2011 (Operation Fast and Furious drug scandal distraction), Aurora 2012, Sandy Hook 2012, LAX 2013 . . . maybe all of them created to distract the world from what an embarrassment the government has become in America. Thanks to TPS for blowing the lid clean off the lies and cover-up, exposing the hoax and making the best documentary about Sandy Hook to date. Visit his channel in the links below for other important videos. I am posting this video to help individuals see that the Federal Government and media outlets work together to promote False Flag operations against the American people. The goal is the destruction of The Constitutional Republic of The United States of America. This is the last standing Super power “supposedly” democratic country standing in the way of The New World Order. The objective of the Sandy Hook Hoax was to disarm the American population so they could be conquered more easily. 2005 Connecticut Code – Sec. 53a-119. Larceny defined. (2) Obtaining property by false pretenses. A person obtains property by false pretenses when, by any false token, pretense or device, he obtains from another any property, with intent to defraud him or any other person. (a) A person is guilty of bribery if he promises, offers, confers or agrees to confer upon a public servant or a person selected to be a public servant, any benefit as consideration for the recipient’s decision, opinion, recommendation or vote as a public servant or a person selected to be a public servant. (b) Bribery is a class C felony. May each and every perpetrator be convicted and do time. The goal is American justice under God and under the rule of law. Prov 24:24-25 (NIV) Whoever says to the guilty, “you are innocent”–peoples will curse him and nations denounce him. But it will go well with those who convict the guilty, and rich blessing will come upon them.